All the Fabrics from Facets Plus...? What can you do with leftovers? To make my Dear Jane quilt called Facets I bought enough fabric for the background and then nineteen fat quarters each of red, green, and blue fabrics. And even though I used each fabric to make three blocks, one pieced triangle, and one solid triangle I still had leftovers. So I cut those up to make a laptop quilt called Facets Remix. But there was still enough fabric left to cut a small diamond from each fabric to make a stacking blocks miniature quilt. Now here is the mystery. 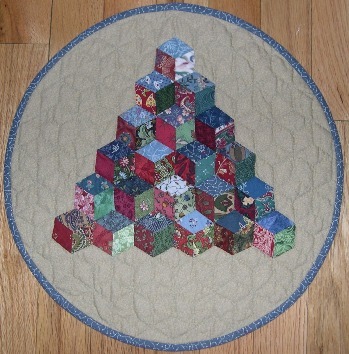 I used nineteen fabrics of each color but there are twenty-one blocks. Did I repeat any fabrics? Did I add fabrics? Oh well, who knows? What I do know is that I still have a shoe-sized boxs of scraps still leftover. My "scrappy" Calico Garden has some of these fabrics.